Even when old man nor’easter whips Otago Harbour into a frenzy of white caps, there’s serenity to be discovered in a glade above the water near Macandrew Bay on the Otago Peninsula. 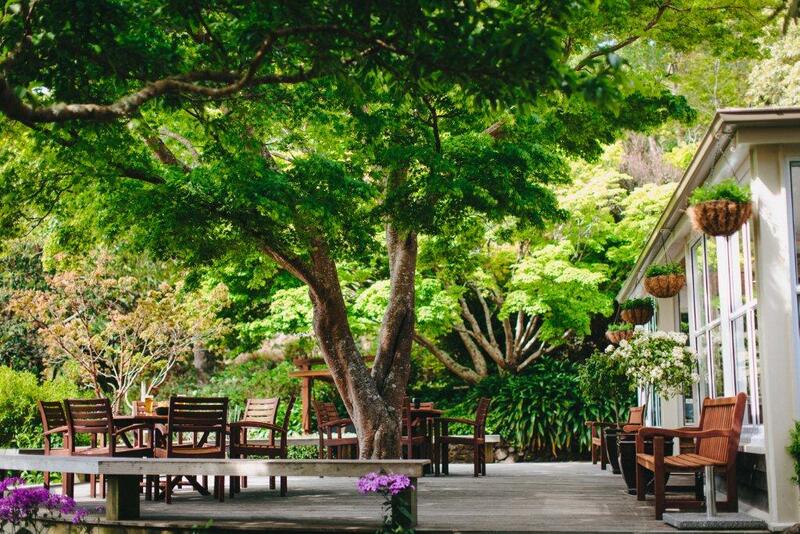 To be found under a giant Japanese maple outside Glenfalloch’s Chalet restaurant. Glenfalloch. Hidden glen. Sheltering a microclimate that belies the elemental nature of this beautiful peninsula, just a ten minute drive from the centre of Dunedin city. Otago Peninsula is itself a destination and Glenfalloch a ‘destination within a destination’ where visitors can enjoy simple, beautiful, locally grown food prepared with passion and flair by the chefs at the Chalet restaurant, or a quiet walk and reflection amid the rhododendrons, lawns and the long established European tree species which grow alongside familiar native New Zealand trees; all of which adds graciousness to this unique green space. In its own little clearing above the bridal lawn there’s a 1,000 year old matai tree – arguably the oldest living tree on the Otago Peninsula. Some believe the tree has magic powers – certainly, the local maori who have inhabited the area for more than 700 years (long before European settlement) believe that matai tees have healing properties. 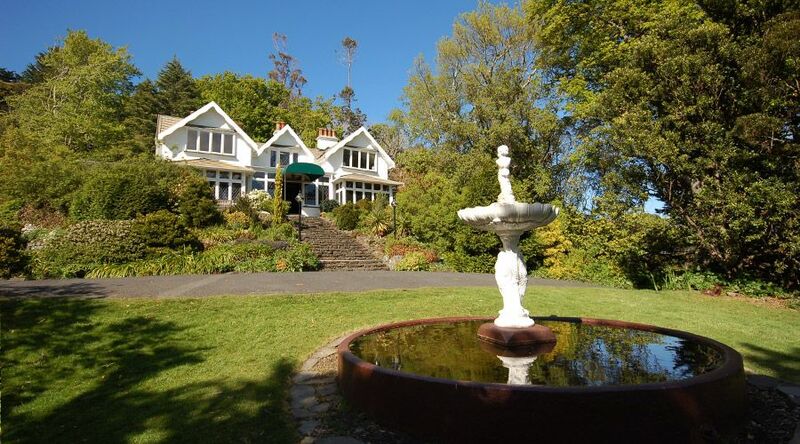 Glenfalloch has long been a favourite celebration place for Dunedinites. Weddings, birthday parties, naming ceremonies, funerals – Glenfalloch has welcomed them all. In the early days these rites were celebrated in what was known as ‘the Chalet’ because the building itself was a quaint, shingle building which did look rather like one of those cuckoo clock Swiss chalets you see on calendars. Sadly,’ the Chalet’ burnt down in the 1970’s but the Otago Peninsula Trust, which has owned and managed the garden and the restaurant since 1967, replaced it with a modern building with a shape and style (if you use your imagination) reminiscent of the original. The name ‘the Chalet’ stuck and the restaurant building still carries it now. But chalet hardly describes the interior, with its high-ceilinged light and air and its modern, inviting décor. As a purpose built function centre it sports a beautifully polished dance floor that doubles as a warming space in front of the elegant stone fireplace, adding a particular ambience on cooler days. And then there is the food. With a little help from local food guru Judith Cullen, the menus have been transformed this year, along with the Chalet’s interior. Lunch is available Thursday to Sunday and the space is still Dunedin’s premier venue for private functions. A variety of menus which take advantage of the fresh seasonal produce available locally ensure that whether it’s lunch or a special family occasion, the fare is relevant to the time of year, delicious and memorable. A wander round the historic garden with its chuckle of stream and quiet paths, often opening onto rich green textures and unexpected splashes of colour, is to experience nature’s aesthetic at its best. Throw in an abundance of birdlife – tuis, bellbirds, grey warblers and even shining cuckoos in the spring – and a day spent at Glenfalloch will fill you up, heart and soul.